Which Pool Material is Best for You? 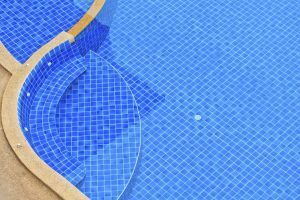 Tile is a great pool material that offers a lot of different color and design options! You have finally decided that you want a pool for your backyard. This is a great investment because it provides fun, relaxation, and exercise for the whole family! Now that you’ve made this choice, you must decide what pool material you want to use. Here is some more information on common pool materials to help make your decision easier. Concrete is a great pool material because it gives you complete freedom with your pool design. You can shape and design your pool any way you’d like with concrete. Putting a coating over top of concrete protects it from any potential leaks. It will take a while for you to be able to swim in your pool if you choose to use concrete because it has to dry completely. Using this pool material offers you a lot of options when it comes to color and design. Pool tiles can add a really nice aesthetic to your pool. However, the joints of the tiles are made from a porous material, meaning water can easily get through it and cause bacteria and algae to build up. To prevent this, you will have to take extra care when cleaning the pool, using extra chemicals and being more thorough. Out of all of the pool material options, vinyl is the most cost-effective. There are a lot of shapes and sizes, however color options tend to be limited with this material. If you don’t mind a simple look for your pool, vinyl is a good option. However, if the aesthetic and design is a main priority for you, you may want to go with something more versatile. This pool material is made of several different materials with different characteristics, making it a very versatile option. The shapes you can choose from are limited with fiberglass because of the way it’s made. This pool material is affordable and installation doesn’t take a very long time. Ready for Your New Pool? Contact Sunrise Premier Pool Builders Today! This entry was posted on Friday, June 22nd, 2018 at 2:19 pm. Both comments and pings are currently closed.